This is a follow-up post to a webinar I did with iTDi during their ‘Summer School’ MOOC on WizIQ. You can see the full list of all the MOOC presenters + presentations here. Below, I’m going to write about iTDi, the recent MOOC, and WizIQ. At the end I’ll post a newly recorded and updated version of my presentation. to provide quality professional development that is meaningful, accessible and affordable for all teachers. We share a vision of a vibrant global community of educators, helping one another to become better teachers. I joined in a couple years back when I saw an online class with John F. Fanselow being offered on iTDi. I’d read his book ‘Breaking Rules’, and I jumped at the chance to learn with him live and direct. This was one of my first experiences with syncronous online learning and it was a very positive experience. I was surprised to find that the webinar interface in many ways enhanced rather than the classroom/training room experience. I loved being able to ‘hear’ others thought as they occured in the chatbox. Links could be posted, even emotions shared with smileys, etc. I even thought it was great that the presenter was at home, dressed casually, sitting in front of a computer. There was something so intimate about it – the furthest thing from a ‘distance’ class! Needless to say, I’ve been hooked on online classes ever since. It didn’t hurt that John F. Fanselow is such a unique and uniquely effective communicator and mentor. What a thrill it was to have him respond sensitively to my in-class comments and give such quality feedback to my and others’ class discussion thread posts. John’s was also one of iTDi’s first ‘Advanced Teaching Skills’ courses. And they’ve only gotten better and better since. I’m sending you this message because you were one of the teachers in our first advanced teaching skills courses, Breaking Rules Live and More Breaking Rules with John F. Fanselow. I don’t know about you, but to me this email was extremely well written and warm. Yep, this small sampling’s got iTDi sauce poured all over it. I think being a member of iTDi means real connection and communication with fellow ELT professions with little to no organizational/hierarchical hoo-ha getting in the way. This means that people can really SHINE THROUGH. And I always feel like I’ll be learning from someone, anyone; TEFL bigwig or random member…sometimes it’s hard to tell! And that’s beautiful. I wound’t be able to do justice to how good that was in my description here. Let’s just say I loved it. In addition to live classes with excellent ELT teachers, trainers, and thinkers, iTDi offers two very thorough and fantastic asyncronous online courses: English for Teachers & Teacher Development. I’m also member of cambridgeenglishteacher.org, where some really high quality courses can be found, and I think iTDi’s offerings definitely rival it. I joined WizIQ in late 2012, long before I became a CELTA trainer (despite what it says in the screenshot below). 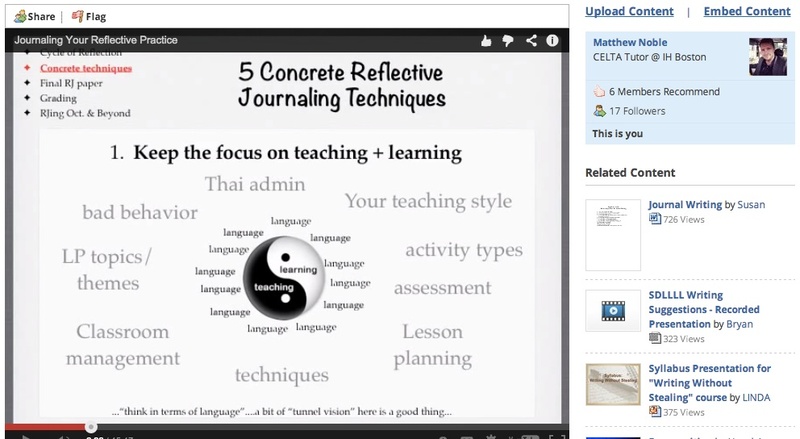 I was tapped to run a ‘Reflective Practice Journaling’ online seminar over the course of a semester for a newly hatched BA TESOL course in Thailand. I chose WizIQ to deliver monthly webinars alongside our weekly Google Hangouts and web board discussions. Beyond the great reflective practice work itself, this was an extremely fruitful project in that I was able to independently explore and experiment with some online educational communication and community-building platforms. To be honest, I chose WizIQ mainly because it fit into the measly budget I was working with. Things like Adobe Connect were out of reach. But I’m glad I did chose WizIQ because it really has continued to develop and grow and these days is clearly making a big push into ELT. So when I signed up to do one of iTDi Summer School MOOC’s webinars, I was already pretty comfortable with WizIQs platform (and impressed by how far it’d come). We can always become better teachers. We believe that as teachers become more skilled, inspired and motivated, the overall quality of education improves as well. Every teacher deserves access to Professional Development. All teachers, no matter what their background or income level, deserve equal access to professional development. This is why we are offering you four weeks of TEFL teacher development training delivered one session at a time by the faculty, mentors, associates, and leading community members of iTDi. In this MOOC you’ll develop your teaching skills, discover new tools and techniques, and explore ideas as you take sessions on a wide range of topics. 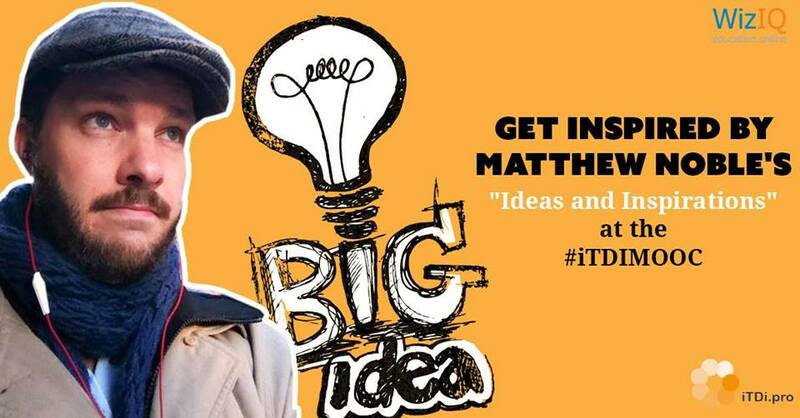 You’ll also get inspired and motivated as you connect with & learn with the iTDi global community: teachers from over 90 countries learning to be better teachers together. Please see the iTDi MOOC Course Schedule for a day-by-day outline of all our planned sessions and to learn more about how you can receive iTDi-certified Professional Development Credit Hours an iTDi Certificates of Participation, Accomplishment or even Accomplishment with Distinction. 35 session in 30 days. It was a whirlwind. And I was thrilled when Chuck Sandy suggested I take part! Is lesson planning a chore? Perhaps a bore? The goal of this session is to reimagine lesson prep as something beyond a ‘nuts and bolts’ part of teaching & explore/‘explode’ it as a ‘preflective’ activity through which we can grow in awareness as teachers. My “Preflective Lesson Prep” presentation represents a rough first pass of an attempt to reflect on, organize, clarify, and express my thoughts on lesson planning as a process, based on my personal experience and what I’ve observed and learned from others over the years. It feels like a doggedly important subject – and one in which many assumptions and conventions are very often taken for granted. 1. What does ‘lesson planning’ mean to you in one sentence? 2. What requirements for “official documentation” of lesson plans do you have in your school or teaching context? 3. What ‘off paper’ lesson prep do you do for yourself? Explain. 4. What is the value of lesson planning for you? 5. What steps do you follow when planning a lesson? 6. Do you think lesson planning becomes less crucial with more experience as a teacher? Why or why not? I’ve been quite active in responding to & encouraging (in simple ways) the 60+ attendees who did answer the questions, and I’m quite happy with the info and experiences people have shared. Trying to comment on every participant’s post is something I was inspired to do by Scott Thornbury. During the class I mentioned above he was extremely active on the chat boards, and it made all the difference! Ah! Well…it was just amazing to have so many people engaged in my little mini-chapter of a MOOC! Teachers from literally all over the world! It was…well, it was incredible to me. I probably sound like a kid in a candy shop at Disney World here, but hey. Perhaps it helps express how I feel about this stuff. Finally, find my cleaned-up and hopefully tightened-up presentation below…and please feel free to offer any and all constructive feedback in the comment section! Thanks for this Matthew! The links lead to some interesting reads and comments. What was this done for? What is iTDi? Forgive my ignorance.